The Foos were due to open the Fillmore in New Orleans on February 15 and 16, but were forced to move the shows to May. 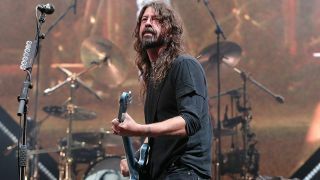 Now it’s been revealed exactly what the injury was – and it’s because vocalist and guitarist Dave Grohl had to have surgery on his left arm. He revealed the news during a talk with Live Nation’s CEO Michael Rapino at the Pollstar Live conference, saying (via Billboard): “This is something I’ve had to deal with for a long time. It’s not the end of the world, but I did have to have surgery on my arm because I need it to pay the rent. “I knew I had to fix my arm at some point and I went ahead and did it." Grohl added: “It's funny having surgery because you actually get a little bit of rest. Right before they wheeled me in, the guys said, ‘Hey, we’re going to give you something that’s going to make you feel really good’ and I thought, 'I finally get to take a nap.'" Prior to his surgery, Foo Fighters played a Super Bowl pre-show concert in Atlanta. They were joined onstage by artists including Tom Morello, Queen’s Roger Taylor and Jane’s Addiction frontman Perry Farrell.